Virtual violence in the real world. 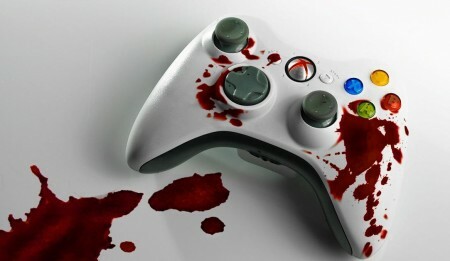 Violence learned through video games can affect a person's behaviour in the real world. Did you know that Violent Games = Violent people? A research was conducted by the University of Missouri and according to the researchers, the brains of violent video game players become less responsive to violence, and this diminished brain response predicts an increase in aggression. Self-control needs to be practiced. Gamer violence is a serious consequence and it will hurt your loved ones if it is not controlled. An article that was published early last year on the 17th of February, showed that a teen clawed his mother with a hammer repeatedly while she was asleep just because his mother took away his Sony PlayStation. Such acts can cause remorse when recalled upon in the future. We don’t often think about the consequences of our actions and what are the driving forces to it. Playing violent games is not a bad thing if self-control is practiced. When you use self-control wisely and with common sense, it helps you to become a better person and helps you attain success. A key point in how self-control helps you is that it keeps you in check personal destruction, addiction, obsession and compulsive behaviour. All this is said by Remez Sasson who is a writer who writes about self-improvement, positive thinking and many other methods to help improve one’s own self. 17-year-old Nicholas Low once threw his controller on the floor which caused the controller to break because he played Call-Of-Duty for a long period of time. Ever since that incident, he has practiced self-control and limits himself for one hour a day for the weekdays and four hours on the weekend. On the other hand, 19-year-old Bryan Fong, who plays violent video games at least 30 hours a week, does not experience any violent behaviour. “I do not become violent when playing violent video games. I have to say that it is the way I was brought up and the values that my parents have instilled in me that have kept me calm when playing violent video games. Like what Marcus Brigstocke said, “If Pac-Man had affected us as kids, we'd all be running around in dark rooms, munching pills and listening to repetitive electronic music.” It is not about the game that makes you violent, it’s whether you choose to be violent. So if you feel you need to have a pledge against violence, let us know your pledge below!